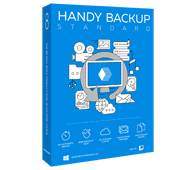 Handy Backup™ is famous for being a Swiss Army Knife of data backup tools. Its functionality covers everything from files-based copying and disk imaging to multi-server backup. There is every feature that you could expect to see in a backup utility, so we welcome you to download the program right now (if you still haven’t done so). The Standard edition lets you back up files, folders, and e-mails to local and USB drives, CD/DVD discs, FTP servers or Online. Supported options include compression, encryption and scheduling.